The Pirate Party of Iceland, which has the smallest faction in the national parliament after the 2013 election, is now almost as popular as the two ruling coalition parties combined, the latest opinion poll showed. The party would score 30.1 percent of votes in Iceland if a general election was held now, the Icelandic National Broadcasting Service (RUV)reportsciting a Gallup poll. Iceland’s two ruling parties - the Independent Party and the Progressive Party – have 22.9 percent and 10.1 percent support respectively, scoring less than 3 percent points ahead of the Pirates. 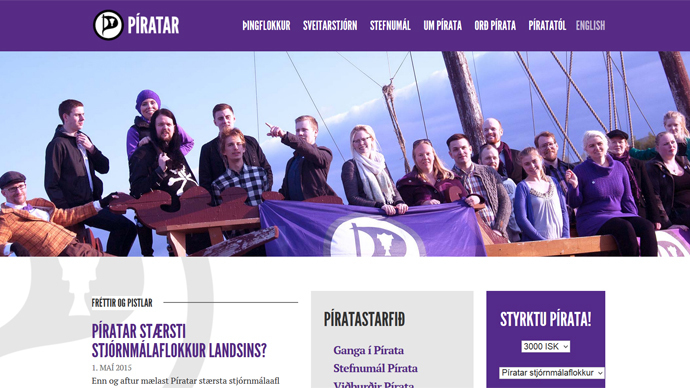 The Pirate Party experienced an astounding surge of popularity in Iceland. In 2013, polls indicated it would barely score 5 percent of votes needed to win parliamentary seats. The party's approval rating in January was roughly the same. An early March Gallup poll showed its popularity had grown to over 15 percent, beating the Bright Future party. In less than two months the Pirate Party doubled its rating. "People are starting to realize that the whole system is corrupt, not just a few politicians," Helgi Hrafn Gunnarsson, Pirate Party's chair and one of its three MPs told Vísir news website in March. "They don‘t trust it at all. I think they appreciate it when someone points this out." Responding to the latest poll, Gunnarsson said he was glad to see such a result but expected it to rebound somewhat in the weeks to come. He added there is still some time to go to the next election in Iceland, which is scheduled for 2017. The same opinion poll showed a 32-percent approval of the government by Icelanders, compared to 37 percent in March. Among the latest big decisions of the government is the March withdrawal of its bid to join the European Union.